From Eaglemoss Collections comes the definitive The Walking Dead figurine collection! Your favorite characters from the hit AMC TV series are meticulously rendered 1:21 scale, standing approximately 3 3/4-inches tall. 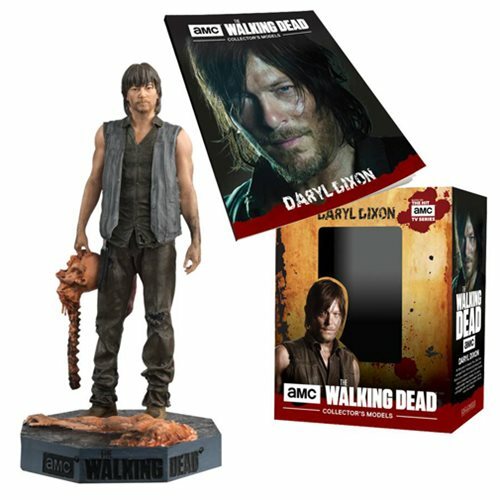 This Daryl Dixon statue is holding a zombie head like a bowling ball and comes with volume #20 12-page companion guide that explores the character, complete with a character profile, and key moments that have defined him. Shown in a classic pose, the Walking Dead Daryl Dixon with Bowling Ball Figure is cast in metallic resin and hand painted. Ages 14 and up.